UFO investigators are up in arms after it was discovered that NASA had removed an Apollo 7 photo showing a triangular UFO from its archive, and that the original had been altered on a NASA affiliate website. It was today claimed that NASA is yet again deliberately covering up UFO evidence. Only a day earlier, NASA was accused of covering up evidence of another UFO being filmed by the International Space Station (ISS). Scott Waring from UFO Sightings, who made the discovery about the missing Apollo 7 photo, says this is another blatant example of NASA deleting or altering data. I have found that NASA has taken down one individual photo that has an odd shaped UFO. The UFO is in orbit around Earth and has good detail to it. I clicked on the link and it gave me error message. NASA not only deleted the photo above, but also went to their old photo indexes and deleted it from there. 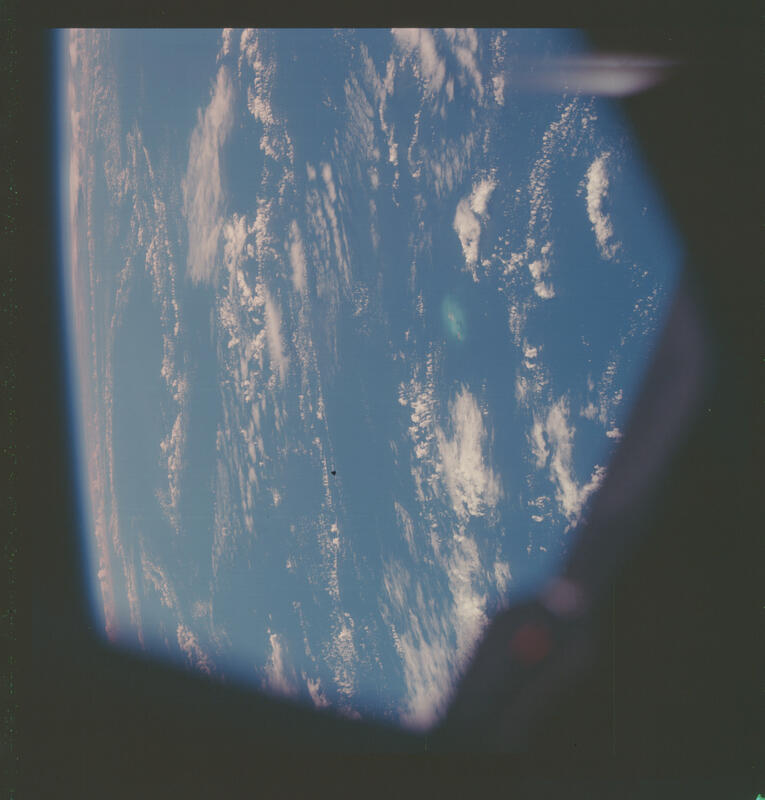 The Apollo 7 photo in question (AS07-07-1738) was originally available on NASA’s Gateway to Astronaut Photography of Earth series on the website of the Johnson Space Center. Now all one gets is a 404 error message. Fortunately, the deleted original photo is still available on the Internet Archive Wayback Machine. When Waring found the same photo (AS07-07-1738) in another NASA affiliate site, the Lunar and Planetary Institute, the UFO had been removed! The photo below was found at a different site and shows that the UFO is gone. Not only that, but the photo itself has added contrast making everything hard to make out. Deliberate efforts have been put in by NASA to hide this UFO from the public. I just wanted to let the public know, NASA does delete UFOs and here is the proof. The original Apollo 7 photo was featured in a Youtube video uploaded on April 3, 2013, that zooms in on the UFO which is very clear. The evidence is conclusive. NASA has been caught red-handed covering up UFO evidence by deleting and altering original Apollo images. Was NASA trying to hide a classified military spacecraft or is it an extraterrestrial vehicle visiting Earth?